Alexander Alexandrovich Novikov, born of humble origins in 1900, rose to command the Soviet Air Forces through most of the Great Patriotic War. He developed a love for flying after winning a short flight in a drawing, but had to wait eleven years before he gained his pilots certificate. His excellence in command of the Red Air Force, encompassing the period of rebuilding through final victory, earned the awards and acclaim afforded him. 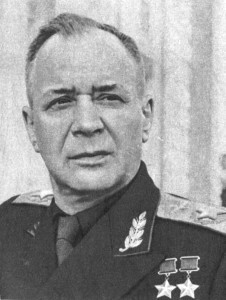 As head of the Air Force, Novikov worked with many of the senior Soviet commanders. He often moved from one critical battle to another and found himself on the first string with another man of peasant origins, Georgy Zhukov. In 1946 Novikov fell victim to a Stalinist purge of his beloved Air Force, only to be released and rehabilitated after the death of the dictator. For over a decade after his retirement from military service the Chief Air Marshal headed the Higher Civil Aviation School. On February 3, 1976 this great commanders life came to an end. Sources in English are few and difficult to obtain particularly primary sources. I recommend the compilation of short biographies edited by Harold Shukman as a source of biographical information not found in campaign histories. In addition to several Russian authors, Professor Shukmans book includes chapters by Geoffrey Jukes, David Glantz, and John Erickson, who contributed the section on Novikov. No writing on the Soviet Air Force in World War II would be complete without mentioning Von Hardestys Red Phoenix as a source of immense value. A U.S. Air Force translation of M. N. Kozhevnikovs Command and Staff of the Soviet Army Air Force in the Great Patriotic War 1941-1945, though it contains some truly warped history, is full of details. Finally, Alexander Boyds history of the Soviet Air Force contained concise accounts of wartime activities.